The front of a Kinaflex twin-lens reflex camera. The focus rings of the two lenses are coupled with gears around their circumference in this simple design. A twin-lens reflex camera (TLR) is a type of camera with two objective lenses of the same focal length. One of the lenses is the photographic objective or "taking lens" (the lens that takes the picture), while the other is used for the viewfinder system, which is usually viewed from above at waist level. In addition to the objective, the viewfinder consists of a 45-degree mirror (the reason for the word reflex in the name), a matte focusing screen at the top of the camera, and a pop-up hood surrounding it. The two objectives are connected, so that the focus shown on the focusing screen will be exactly the same as on the film. However, many inexpensive "pseudo" TLRs are fixed-focus models. Most TLRs use leaf shutters with shutter speeds up to 1/500th sec with a B setting. For practical purposes, all TLRs are film cameras, most often using 120 film, although there are many examples which used 620 film, 127 film, and 35mm film. No general-purpose digital TLR cameras exist, since the heyday of TLR cameras ended long before the era of digital cameras. In 2015, MiNT Camera released Instantflex TL70, a twin-lens reflex camera that uses Fuji instax mini film. ✪ InstantFlex TL70 Unboxing! The worlds only twin lens reflex instant camera! Double-lens cameras were first developed around 1870, due to the realization that having a second lens alongside the taking lens would mean that one could focus without having to keep swapping the ground glass screen for the plate, reducing the time required for taking a picture. This sort of approach was still used as late as the 1960s, as the Koni-Omegaflex testifies. The TLR camera was thus an evolution. Using a reflex mirror to allow viewing from above also enabled the camera to be held much more steadily than if it were to be held in the hand. The same principle of course applied to SLR cameras, but early SLR cameras caused delays and inconvenience through the need to move the mirror out of the focal plane to allow light to pass to the plate behind it. When this process was automated, the movement of the mirror could cause shake in the camera and blur the image. The London Stereoscopic Co's "Carlton" model is claimed to have been the first off-the-shelf TLR camera, dating from 1885. The major step forward to mass marketing of the TLR came with the Rolleicord and then Rolleiflex in 1929, developed by Franke & Heidecke in Germany. The Rolleiflex was widely imitated and copied and most mass-market TLR cameras owe much to its design. It is said that Reinhold Heidecke had the inspiration for the Rollei TLRs whilst undertaking photography of enemy lines from the German trenches in 1916, when a periscopic approach to focusing and taking photos radically reduced the risk to the photographer from sniper fire. TLRs are still manufactured in Germany by DHW Fototechnik, the successor of Franke & Heidecke in three versions. Higher-end TLRs may have a pop-up magnifying glass to assist the user in focusing the camera. In addition, many have a "sports finder" consisting of a square hole punched in the back of the pop-up hood, and a knock-out in the front. Photographers can sight through these instead of using the matte screen. This is especially useful in tracking moving subjects such as animals or race cars, since the image on the matte screen is reversed left-to-right. It is nearly impossible to accurately judge composition with such an arrangement, however. Mamiya's C-Series, introduced in the 1960s, the C-3, C-2, C-33, C-22 and the Mamiya C330 and Mamiya C220 along with their predecessor the Mamiyaflex, are the main conventional TLR cameras to feature truly interchangeable lenses. "Bayonet-mount" TLRs, notably Rolleis & Yashicas, had both wide-angle and tele supplementary front add-ons, with Rollei's Zeiss Mutars being expensive but fairly sharp. Rollei also made separate TLRs having fixed wide-angle or tele lenses: the Tele Rollei and the Rollei Wide, in relatively limited quantities; higher sharpness, more convenient (faster than changing lenses) if one could carry multiple cameras around one's neck, but much more costly than using 1 camera with supplements. The Mamiya TLRs also employ bellows focusing, making extreme closeups possible. Many TLRs used front and back cut-outs in the hinged top hood to provide a quick-action finder for sports and action photography. Late model Rollei Rolleiflex TLRs introduced the widely copied additional feature of a second-mirror "sports finder". When the hinged front hood knock-out is moved to the sports finder position a secondary mirror swings down over the view screen to reflect the image to a secondary magnifier on the back of the hood, just below the direct view cutout. This permits precise focusing while using the sports finder feature. The magnified central image is reversed both top-to-bottom and left-to-right. This feature made Rolleis the leading choice for press photographers during the 1940s to 1960s. A primary advantage of the TLR is in its mechanical simplicity as compared to the more common single-lens reflex cameras. The SLR must employ some method of blocking light from reaching the film during focusing, either with a focal plane shutter (most common) or with the reflex mirror itself. Both methods are mechanically complicated and add significant bulk and weight, especially in medium-format cameras. Because of their mechanical simplicity, TLR cameras are considerably cheaper than SLR cameras of similar optical quality, as well as inherently less prone to mechanical failure. SLR shutter mechanisms are comparatively noisy. Most TLRs use a leaf shutter in the lens. The only mechanical noise during exposure is from the shutter leaves opening and closing. TLRs are practically different from single-lens reflex cameras (SLR) in several respects. First, unlike virtually all film SLRs, TLRs provide a continuous image on the finder screen. The view does not black out during exposure. The separate viewing lens is also very advantageous for long-exposure photographs. During exposure, an SLR's mirror must be retracted, blacking out the image in the viewfinder. A TLR's mirror is fixed and the taking lens remains open throughout the exposure, letting the photographer examine the image while the exposure is in progress. This can ease the creation of special lighting or transparency effects. TLRs are also ideal for candid camera shots where an eye-level camera would be conspicuous. A TLR can be hung on a neck strap and the shutter fired by cable release. Models with leaf shutters within the lens, rather than focal-plane shutters installed inside the camera body, can synchronize with flash at higher speeds than can SLRs. Flashes on SLRs usually cannot synchronize accurately when the shutter speed is faster than 1/60th of a second and occasionally 1/125th. Some higher quality DSLRs can synchronize at up to 1/500th of a second. Leaf shutters allow for flash synchronization at all shutter speeds. Owing to the availability of medium-format cameras and the ease of image composition, the TLR was for many years also preferred by many portrait studios for static poses. Extreme dark photographic filter like the opaque Wratten 87 can be used without problems, as they cover and thus darken only the taking lens. The image in the viewfinder stays bright. Few TLR cameras offered interchangeable lenses and none were made with a zoom lens. In systems with interchangeable lenses, such as the Mamiya, the fixed distance between the lenses sets a hard limit on their size, which precludes the possibility of large aperture long-focus lenses. The lenses are also more expensive because the shutter mechanism is integrated with the lens, not the camera body, so each lens pair must include a shutter. Because the photographer views through one lens but takes the photograph through another, parallax error makes the photograph different from the view on the screen. This difference is negligible when the subject is far away, but is critical for nearby subjects. Parallax compensation may be performed by the photographer in adjustment of the sight line while compensating for the framing change, or for highly repeatable accuracy in tabletop photography (in which the subject might be within a foot (30 cm) of the camera), devices are available that move the camera upwards so that the taking lens goes to the exact position that the viewing lens occupied. [Mamiya's very accurate version was called the Para-mender, and mounted on a tripod.] Some TLRs like the Rolleiflex (a notable early example is the Voigtländer Superb of 1933) also came with - more or less complex - devices to adjust parallax with focussing. It is generally not possible to preview depth of field, as one can with most SLRs, since the TLR's viewing lens usually has no diaphragm. Exceptions to this are the Rolleiflex, the Mamiya 105 D and 105 DS lenses, which have a depth of field preview. As the viewfinder of a TLR camera requires the photographer to look down toward the camera, it is inconvenient to frame a photo with a subject that requires the camera to be positioned above the photographer's chest unless a tripod is used. In these cases, the camera may be positioned with the lenses oriented horizontally. Due to the TLR's square format, the composition need not be altered. The image in the waist-level finder is reversed 'left to right' which can make framing a photograph difficult, especially for an inexperienced user or with a moving subject. With high-quality TLRs like the Rolleiflex and the Mamiya C220/C330 the waist-level finder can be replaced by an eye-level finder, using a roof pentaprism or pentamirror to correct the image while making it viewable through an eyepiece at the rear of the camera. The design of the leaf shutter limits almost all TLRs to a maximum shutter speed between 1/100th and 1/500th of a second. Certain photographic filters are inconvenient without line of sight through the taking lens - notably, graduated neutral density filters are hard to use with a TLR, as there is no easy way to position the filter accurately. The typical TLR is medium format, using 120 roll film with square 6×6 cm images. Presently, the Chinese Seagull Camera is still in production along with Lomography's Lubitel, but in the past, many manufacturers made them. DHW-Fototechnik GmbH, continues to make the Rolleiflex TLR, as well. The Ciro-flex produced by Ciro Cameras Inc. rose dramatically in popularity due in large part to the inability to obtain the German Rollei TLRs during World War II. The Ciro-flex was widely accessible, inexpensive, and produced high quality images. Models with the Mamiya, Minolta and Yashica brands are common on the used-camera market, and many other companies made TLRs that are now classics. The Mamiya C series TLRs had interchangeable lenses, allowing focal lengths from 55mm (wide angle) to 250mm (telephoto) to be used. The bellows focusing of these models also allowed extreme closeups to be taken, something difficult or impossible with most TLRs. The simple, sturdy construction of many TLRs means they have tended to endure the years well. Many low-end cameras used cheap shutters however, and the slow speeds on these often stick or are inaccurate. There were smaller TLR models, using 127 roll film with square 4×4 cm images, most famous the "Baby" Rolleiflex and the Yashica 44. The TLR design was also popular in the 1950s for inexpensive fixed focus cameras such as the Kodak Duaflex and Argus 75. Though most used medium format film, a few 35mm TLRs were made, the very expensive Contaflex TLR being the most elaborate, with interchangeable lenses and removable backs. The LOMO Lubitel 166+, a natively medium format camera, comes with an adapter for 35mm film. The only twin lens reflex camera that uses instant film is Instantflex TL70 manufactured by MiNT Camera which is compatible with Fuji instax mini film (film size 54 X 86 mm, picture size 46 X 62 mm) . It is the world's first instant twin lens reflex camera. Gemflex is a subminiature twin lens reflex camera made by Showa Optica Works (昭和光学精機) in occupied Japan in the 50s. 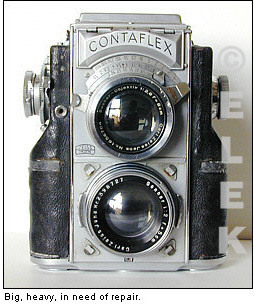 Gemflex resembles the well known Rolleiflex 6x6cm twin lens reflex, but much smaller in size. The body of Gemflex is die cast from shatter proof metal. The smallest photography TLR camera using 35mm film is the Swiss-made Tessina, using perforated 35mm film reloaded into special Tessina cassette, forming images of 14×21 mm. Goerz Minicord twin lens reflex made 10x10mm format on double perforated 16mm film in metal cassette. 6 Element Goerz Helgor F2 lens, metal focal plane shutter B,10,25,50,100 and 400. Viewing lens uses pentaprism reflex optics for the viewing lens. Picture format 10x10mm on double perforated 16mm film. Minox rebadged Sharan Rolleflex 2.8F classic retro TLR film camera, 1/3 scale 6x6 Rolleiflex TLR, using Minox cassette image size 8x11mm, 15mm F5.6 glass triplet lens, mechanical shutter 1/250 sec. Japan made Gemflex, a twin lens reflex using 17.5mm paper back roll film. It has been argued that the medical gastroscopy camera, the Olympus Gastro Camera is technically the smallest TLR device. ^ Holmes, Edward (1978). An Age Of Cameras. p. 11. ISBN 978-0-8524-2346-2. Retrieved 27 June 2015. ^ "Koni-Omegaflex". www.tlr-cameras.com. Retrieved 10 April 2018. ^ "WWW.TLR-CAMERAS.COM/History". www.tlr-cameras.com. Retrieved 10 April 2018. ^ "DHW Fototechnik unveils new version of the classic Rolleiflex TLR camera". ^ "WWW.TLR-CAMERAS.COM/Mamiya". www.tlr-cameras.com. Retrieved 10 April 2018. ^ However, the (6×6 cm) Koniflex (from Konica) is one of several others sold in small volumes to have a supplementary tele lens, and the (6×7 cm) Koni-Omegaflex (cited above) can be used as a TLR with an optional finder and has interchangeable lenses. ^ "Dance Movement Photography (DOC format)". arcaimaging.com. Retrieved 10 April 2018. ^ "Voigtlander". www.tlr-cameras.com. Retrieved 10 April 2018. ^ "Rolleiflex Twin-Lens Reflex". www.dhw-fototechnik.de. Retrieved 10 April 2018. ^ Mike Roskin, "Occam's Ciroflex," Camera Shopper, May, 1995, 38. ^ "Olympus Gastro Camera". www.tlr-cameras.com. Retrieved 10 April 2018. Wikimedia Commons has media related to Twin-lens reflex cameras.